If you’ve ever “grabbed some freshies” after a massive storm has hit the Wasatch mountains, you’ve met the guy who inhales his peanut butter and jelly sandwich on the lift and drops M&Ms from his pocket on the way down the hill—either to not miss a single powder turn or just to make rent. I happen to be married to “that guy,” but there’s no doubt you’ll invariably find me mingling with the après ski crowd in the lodge at every opportunity for more refined sips and bites. With so many changes in store for Canyons Resort over the next year—from a new name to a connection to Park City Mountain Resort—those who frequent Canyons have a lot to look forward to. Fortunately, if you’re anxious to enjoy a bite between runs now, six on-mountain eateries are churning out handcrafted, locally sourced, and surprisingly stellar cuisine - no matter where you find yourself on the mountain. 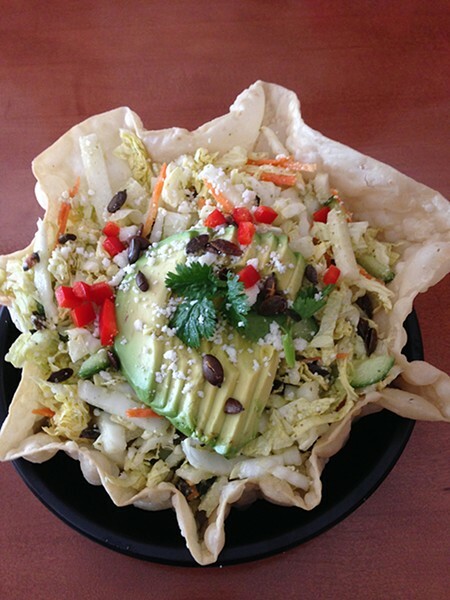 Just above Sun Peak Express lift, slide into the Sun Lodge for hearty sandwiches, burgers and salads. Two items jump to the top of the must-have list here. 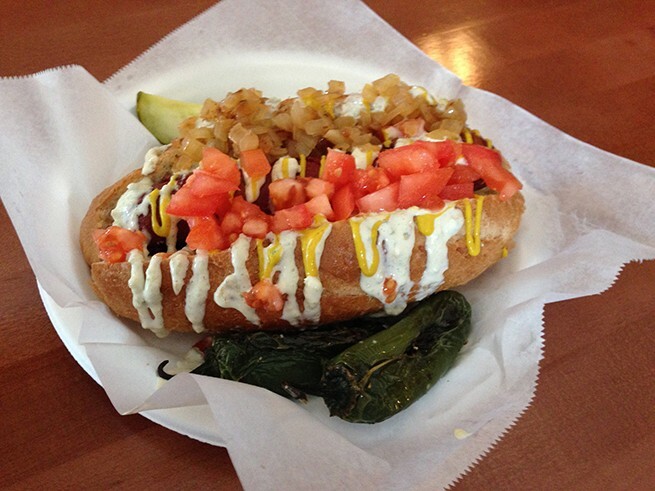 The Sonoran Dog starts with a bacon-wrapped, all-beef hot dog loaded with pinto beans, grilled onions, fresh tomatoes and finally splashed with a kicky jalapeno mango sauce and mustard. This is also the place to find the only Reuben on the mountain. The Rendezvous Rueben Panini didn’t disappoint with a generous serving of house-made pastrami below the sauerkraut and Russian dressing on grilled rye. Wash it all down with a brew and continue down the slopes. To take in the view of Canyons’ vast expanse, get off at the mid-mountain stop on the Orange Bubble Express lift and head to Lookout Cabin for table service and a full bar. 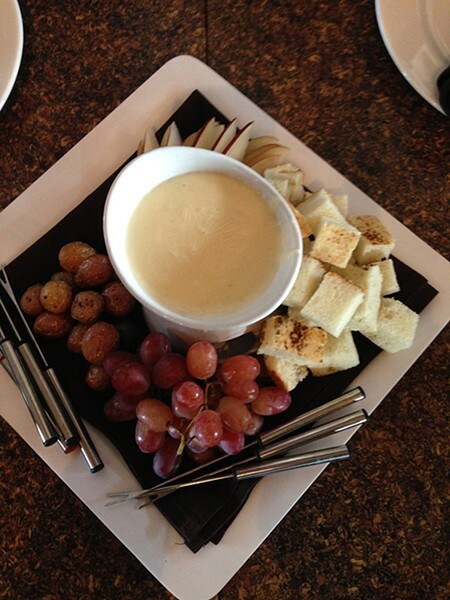 Pull up a chair on the patio and dip into the Rocky Mountain Fondue—an addictive blend of smoked Utah cheddar, Swiss Appenzeller and hard apple cider—served with sliced apple, bread cubes, and salted baby potatoes. 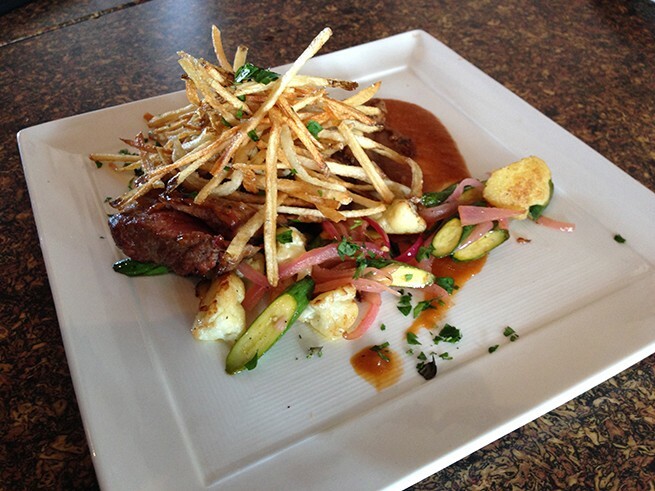 Vegetarians will rejoice at the acorn squash risotto entrée served in-shell and kicked up with fresh herbs and parmesan while carnivores can savor the prime-cut flat iron steak with a High West whiskey glaze and crispy shoestring frites. Near the top of Dream Peak, you’ll find Cloud Dine. Expanded and rebuilt this past summer, diners will encounter restaurant-quality offerings in a cafeteria-style setting. 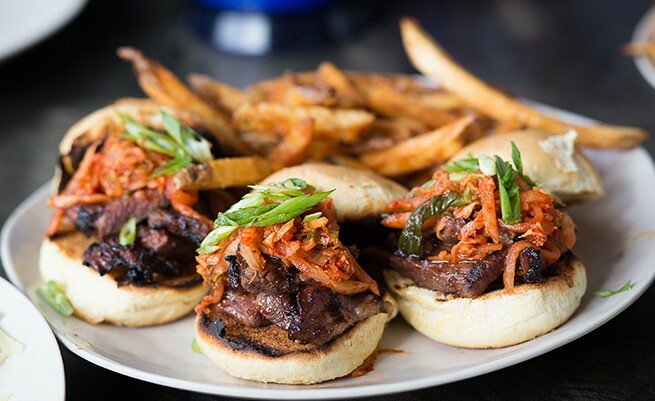 Sample the Korean BBQ beef sliders featuring glazed short ribs and a spicy kimchi on Hawaii sweet buns or the Pig in a Parka—a gourmet Kobe beef hot dog baked in homemade pretzel dough and served with a cheddar cheese dipping sauce. For healthier offerings, the roasted veggie pizza gets inventive with a creamy butternut squash puree “sauce” topped with sweet cipollini onions, fennel, sage, crunchy pine nuts and queso fresco that results in a rich and satisfying slice. The Stratocumulus is a heavenly rendition of a Nicoise salad. Expertly seared tuna, fingerling potatoes and French green beans along with the classic hardboiled egg, greens and olives are all tossed with a red wine mustard vinaigrette for a bowl that is both protein-packed and mouthwatering. Finally, whether you are looking to start the day at Cloud Dine or just end your meal, save room for the house-made doughnuts that are so memorable they’re now available at every Vail property. With phone charging stations near the restrooms and reusable dishware to significantly reduce the amount of trash needing to be removed from the mountain on a daily basis, the bright and cheery Cloud Dine might inspire you to sit and stay a while—and enjoy just one more beer before heading down through The Colony. On your way up to Ninety-Nine 90, take a break at the ski beach at the bottom of Tombstone Express lift for some slow-smoked barbecue. 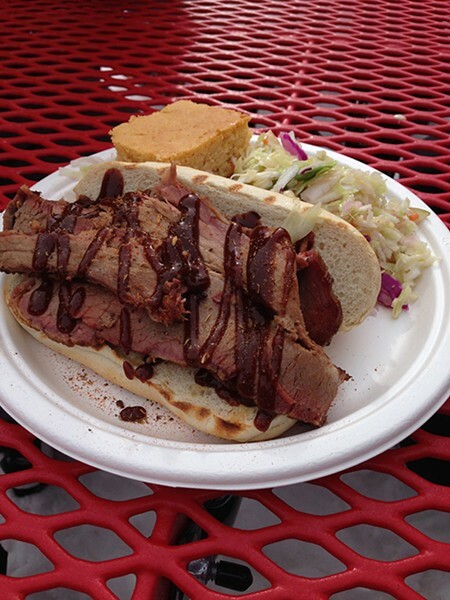 Tombstone Grill serves up brisket, juicy sausage and short rib sandwiches with a side of coleslaw and slab of cornbread with honey butter. Whether you intend to take the Red Pine Gondola down to base lodge or just need a rest stop before heading back up the mountain, let the smell of freshly griddled waffles draw you over to Waffle House for a sugar shot. 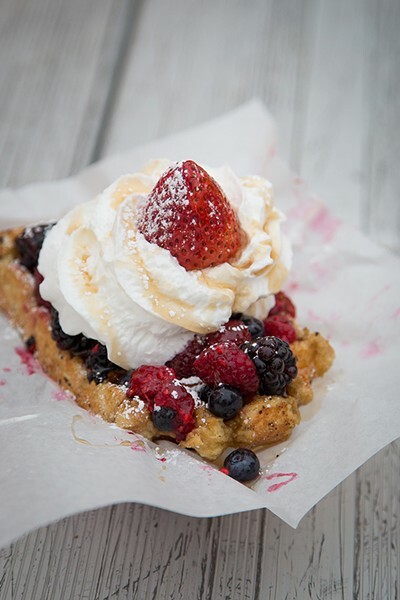 Enjoy a classic Belgian waffle topped with sweet syrup and a mélange of raspberries, blackberries and blueberries floating on whipped cream or the chocolate chip waffle covered in banana slices drizzled with chocolate sauce and walnuts. Savory waffle sandwich offerings are also available here as well. 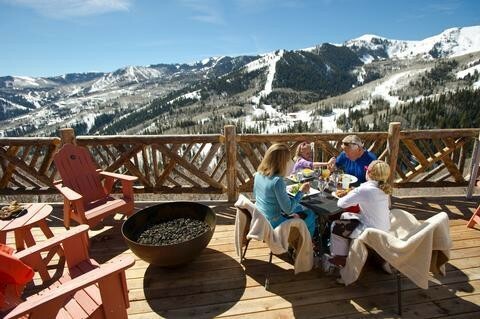 Once back at base lodge, head to The Farm for cocktails and après ski or a full dinner. Sustainably raised and locally sourced fare is high on the menu—everything from bison chili with Gold Creek smoked cheddar to Koosharem steelhead trout. 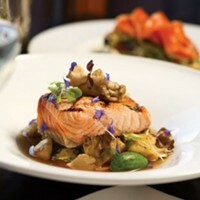 With so many high-quality dining options overseen by Canyons Executive Chef Alex Malmborg, the only problem diners with have at Canyons is deciding where to spend their precious calories after the next run. As for me, I’ll be with the dude chasing after the Uinta Cutthroat Ale rolling down the parking lot after it fell out of the truck.